I always look forward to coming back to Cratfield. It's one of the loveliest spots in Suffolk, miles from anywhere, and, if I may be forgiven for a flight of fancy, the sun is always shining and the birds are always singing, or at least they are for me. They certainly were at the end of March 2019, a beautiful early spring day. I'd cycled down from Metfield crossing the windy sugar-beet plain, its hedgerows all denuded, with Laxfield's mighty tower forever on the horizon. It seemed to be where I was heading, and indeed I would be in due course, but first the road descended into a green valley, and this pretty church sat waiting in its bosky glade. 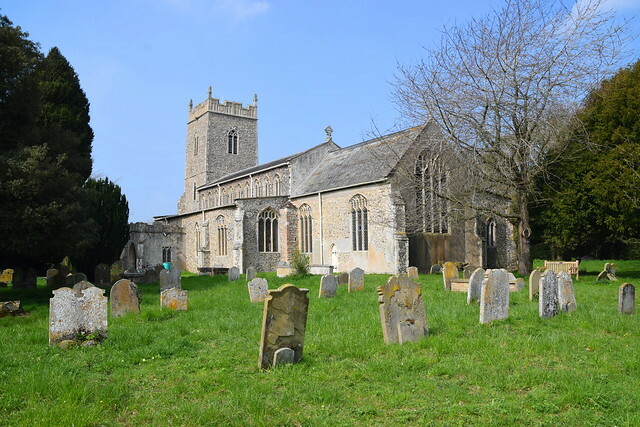 This is not a big church, and yet it has all the features you might expect from Suffolk in the 15th Century, with aisles, clerestories and a grand porch. In the spandrels of the porch a woodwose and a wyvern lay in wait. The wild man with his club and shield seems more intent and dangerous than the wyvern. 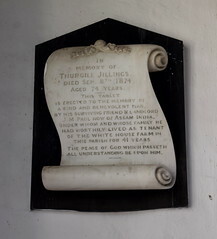 Not large then, but it would be true to call this church elaborate, and the sequence in which this happened are largely known to us for Cratfield has one of the most complete sets of vestry minutes in England. That lovely tower top, for example, is right on the eve of the Reformation, for when the gloves came off the parish sold all its silver rather than let it fall into the government coffers, and then they spent the proceeds on decorating the tower. But the hand of the Victorians fell here too, fortunately the customary light touch of diocesan architect Richard Phipson rather than that of anyone more enthusiastic. 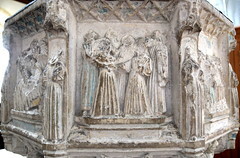 You step in to be presented with one of the more significant medieval art objects in the county, the glorious seven sacrament font. Cautley thought it the finest, and certainly the quality of the carving is of a higher order than that of many of the others. 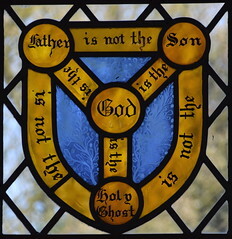 The intricacy can be matched by the font at Little Walsingham in Norfolk. 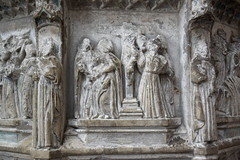 Sadly, two of the panels have been entirely destroyed, presumably by the Anglican reformers of the 1540s and 1550s, but the rest, once made flush with a hammer, spent several centuries behind plaster. Not only have six of the designs survived in something like their original integrity, but they even retain traces of colour. 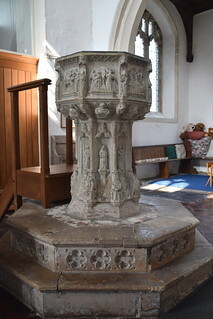 The setting of the font is quite different to that of the seven sacrament font at neighbouring Laxfield, where the fat bowl sits on a stubby stem at the centre of a great cross. Here, the bowl and stem are slender, like an opening flower. The pedestal seems almost too large. 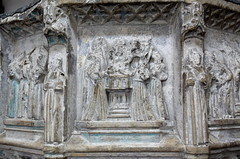 The shaft is home to eight seated figures, evangelists and apostles all, interspersed with symbols of the evangelists. 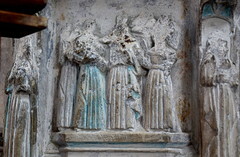 Above the supporting angels, more figures stand at the corners, including Suffolk favourites St Dorothy and St Edmund. 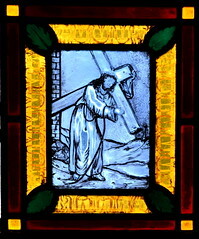 The south-eastern panel shows the crucifixion. 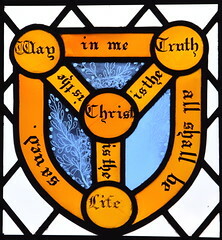 Then in a clockwise direction, we find baptism, confirmation, a blank, a blank, ordination, marriage, last rites. The blanks are Mass and Confession, perhaps a sign of early Anglican anger. 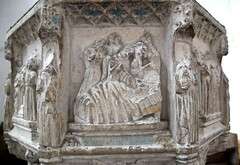 The odd-panel-out is often eastward or westward, so possibly this font has been moved at some time, probably by Phipson. Since mass and confession have both been completely destroyed, this font doesn't have the harmony of some others despite its delicacy. This was the first of four seven sacrament fonts I saw on this bike ride (there are only ten in the whole of Suffolk) and all of them are different in style. 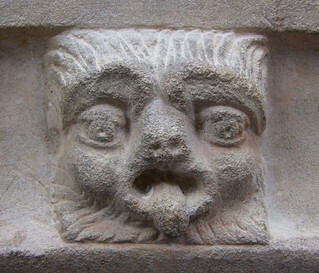 Of those four, Badingham is my favourite, its carvings revealing the humanity of the featured characters, and elsewhere in Suffolk Westhall is my very favourite one of all. 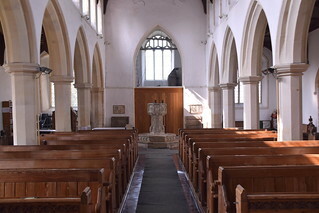 Beside the font, against the west wall is part of the screen, which Phipson placed here when engaged on his 1879 restoration. 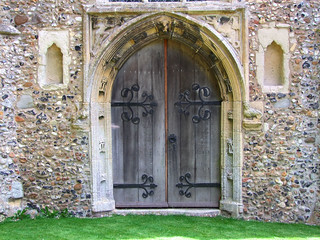 He was fresh from his triumph at St Mary le Tower in Ipswich, and turned a kindly eye to this remote outpost. 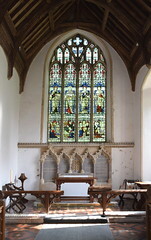 The St Edmund chapel, now a vestry, the furnishings, and the rood loft stairs all still bear witness to their origins beyond the gulf of the 1540s, and this country's cultural revolution. 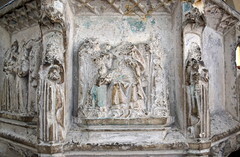 The 18th century memorial to Sarah Mynne appears to intentionally overlay a medieval aumbry - did her heirs intend it to serve as a dole cupboard of some kind? 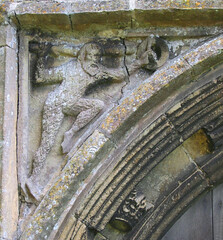 Or was the aumbry only found and opened by Phipson? All these are fascinating details of a neat, bright, tidy little place. Treasures to be contemplated in tranquility - what more could one ask? 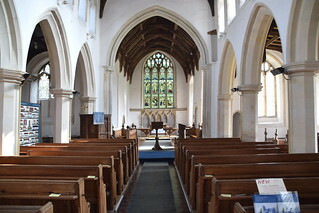 And also the cool interior of the church, the somnolent green churchyard, these stay long in the memory too. The qualities of peace are measured against such as these.